We have seen this movie before. Invigoration is pouring out of Islamabad these days as it tries to wrap up its Swat offensive and extend the frontline deeper into Pakistan’s northwest. Everyone says that this time Pakistan’s crackdown is different. Islamabad, Rawalpindi, the ISI and everyone else finally gets it: jihadis do not make for good neighbours. The Pakistan Army is clearing Taliban territories; militants are fleeing from their ‘entrenched’ positions to avoid the rain of artillery shells; and Rawalpindi is gearing up for the last showdown in Waziristan. Until the next one, that is. At a time when Islamabad is insisting louder than ever that it has always been honest and sincere in its counterterrorism efforts since 9/11, other wheels are squeaking differently. Former President Musharraf told Fareed Zakaria in May that “of course” Islamabad has contact with the Taliban. “After all,” he continued, “the KGB had contacts in CIA. CIA had contacts in KGB. That is how you have ingress into each other, and that is how you can manipulate things in your favour.” Fair enough. But if today’s state of affairs is how one might describe “in your favour”, then what does a bad day look like? The truth is that Musharraf and most of the local Islamist groups agreed to ignore each other’s consolidation of power in their respective neighbourhoods, allowing insidious ‘rogue’ elements of the ISI to cultivate and enhance their own ‘ingress’ with the Taliban. To be sure, many believe that whether these ‘rogue’ operators are officially unofficial or unofficially official, they continue informing, arming, training and trouble-shooting for the Taliban and its various jihadi brethren—ranging from self-righteous warlords to the sophisticated Jamaatud Dawa to Al Qaeda wannabes. Granted, the government is currently putting up quite a fight in Swat, but in the meantime, the people of Sindh are terrified that droves of Taliban IDPs are on the cusp of bringing Mingora’s fate to Karachi, while Punjabis are enduring suicide bombings because the militants there typically fighting in Kashmir decided to host and train aspiring Pakistani Taliban. Once Pakistan publicly ‘turned’ on domestic extremists, the disparate militants in Pakistan found a common enemy in Islamabad and largely abandoned the struggle in Kashmir. So who can counter this newly congealed beast? Now that the military has put its full weight behind this offensive, potentially for the long haul, it has a chance to reverse many of the gains the Taliban made when Washington was focused on Iraq and Musharraf was focused on himself. Most importantly, this can be done without the government incurring any more wrath than it already has incurred. Gone are the days when Islamabad walked a ‘fine line’ to ensure that the Islamists were both unrestrained and distracted by external enemies. If the Lal Masjid massacre cleared up any confusion about where Islamabad’s allegiance officially lies, then the operation in Swat serves as a considerably larger clarification. Every Pakistani who is capable of supporting the Taliban has as much reason to do so today than he or she ever had or ever will. But that is not all bad news; if everyone thinks the gloves have already come off, then Islamabad need not continue wearing those gloves out of habit. Using widespread perceptions to adjust and guide strategy is vital to any successful military operation. For a similar reason, the massive failure of Islamabad’s February appeasement of the TTP in Swat has galvanised most of the country into swallowing the horrendous civilian casualties associated with purging Swat of the Taliban. At long last, Pakistanis seem to recognise that this operation — or something very similar to it — was inevitable and necessary to ensure both the stability of all of Pakistan and the security of all Pakistanis. So, expanding the operation into the rest of NWFP and even Fata (as the army has begun doing) is the natural extension of this logic, much to Washington’s delight. But Musharraf once exhibited such determination, as well, mostly in vain. As usual, India holds the key to Pakistan’s insecurities, for better or worse. The Pakistan Army’s troops based along the Afghan border can clear plenty of northwestern territory and plausibly insist that this is significant. But the real question is holding the territory, and artillery is no permanent substitute for trained soldiers in this regard — not in Swat and not in Waziristan. Yet Rawalpindi simply does not have the flexibility to transfer the needed army divisions from Punjab to the northwest because the daunting million-man Indian army is still saturating Pakistan’s eastern border. No sudden resolve in Islamabad to eliminate Baitullah Mehsud can change this military reality. So what reassurance would Pakistan need before moving brigades westward? Several divisions of India’s strike forces would have to pull back from the border as well. When Washington realises that its latest push for a demilitarised Line of Control is not going to happen any time soon, it will push harder for a temporary drawdown of forces at the international Indo-Pak border. The time frame for deployment could be short to start, perhaps six months to a year, barely enough to assist Rawalpindi’s effort in the tribal belt. But this is naturally a tough sell in Delhi, as jihadi infiltration is a major Indian concern. Admittedly, however, there is a large degree of redundancy in these Indian strike forces, and most of them are tasked with impeding Pakistani tanks, not small-scale jihadi cells. Still, US President Barack Obama would have to offer Delhi something in return for such a noticeable stand-down. The most likely (if private) indulgence would be for President Obama to promise Delhi that his administration will never utter a single word of concern or advice about the Indian occupation of Kashmir. Undoubtedly, the stability of Pakistan and the impotence of Al Qaeda are far too important in Washington to allow the aspirations of Kashmiris to hold sway. This would be the most powerful and immediate concession that Delhi can request and the easiest for Washington to grant, once it recognises Rawalpindi’s limitations with the current deployments. Accordingly, Delhi would be under no pressure to resume or invigorate negotiations with Pakistan about Kashmir or any other matter, even if/when Pakistan is able to contain the militants in Fata. Such a trade could be devastating for the Kashmiris, depending on how much Delhi wanted to milk the concession, but unless Washington grudgingly indulges India in this way, Pakistan will not have the flexibility to move its troops and prevent the creation of more Kashmirs in its own heartland. Islamabad, after all, only has so much ingress to go around. The rest is up to India. 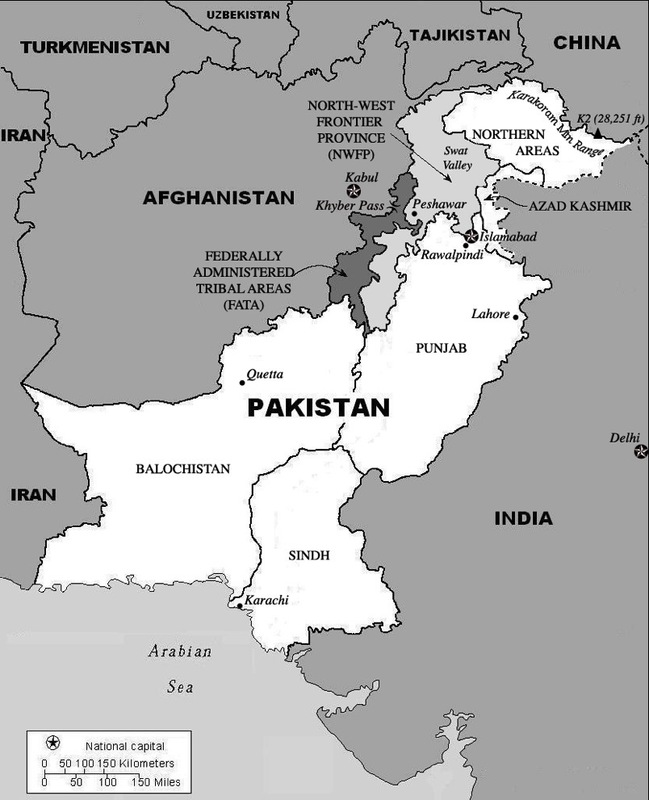 If the Pakistani Government really considers the Taliban threat to its sovereignty in all seriousness as THE threat, shouldn’t that be sufficient motivation to shift at least a significant number of troops to their north western provinces? Especially considering in all previous wars with India, Pakistan has always been the agressor? Also, how could the Obama administration ask the Indian government to stand down, when it has been proved time and again that Pakistan HAS been infiltrating terrorists to India through their common border and has always shown itself as an unreliable neighbor? Hi Gautam, thanks for your comment. If the Taliban is THE threat, then you are correct: that fact should absolutely be sufficient motivation for the Pakistan Army to redeploy tens of thousands of troops to the Pashtun Corridor… but it’s not sufficient. I’m not urging India to withdraw some of its troops because I think Pakistan deserves such a withdrawal. It is not a matter of who is the aggressor and who is the victim, though I think your argument is a bit simplistic. It is simply a matter of cause and effect. India has nothing to gain by invading Islamabad, and everyone knows that Pakistan needs to reallocate soldiers. So, that should add up to common sense in Islamabad, but it doesn’t. Pakistan’s military and even civilian leadership genuinely believe that they are going to be able to break the Taliban’s back without uprooting entire divisions of the Army in Punjab. But this perception is an illusion, and a fairly contagious one because it ruffles the fewest feathers and tells people what they want to hear. I want India to make it easy for Pakistan to move those troops not because India owes it to Pakistan, but because it will prevent Pakistan from repeating Musharraf’s feigned assault on the Taliban. When Pindi claims to have defeated the Pakistani Taliban in about 6 months, the victorious Army will withdraw, pretend to prop up the Awami National Party and Frontier Corps, and ask Washington to pay the bill. In the meantime, the Pakistani Taliban will do exactly what the Afghan Taliban did around 2004: wait for the bombs to stop falling, and regroup. If India can create a situation where Pakistan isn’t compelled to delude itself into thinking it can win this war with artillery, then India should create that situation. Not because Pakistan is ‘reliable’ or because Indians are over-defensive, but simply because Pakistan is coming undone, and India is in a position to prevent it. The only question is, how to convince Delhi. I agree that India should pull back, not because it owes it to Pakistan, but because it owes it to itself. I believe India has the most to lose if Pakistan is totally destabilized simply because it is the closest target for whatever regime replaces the current democratic government there. However, I don’t believe any amount of exhortation from the Obama administration or any other government will induce India to pull back or reduce the number of troops on its borders. There’s simply too much distrust, which cannot be overcome just because of soaring rhetoric from the head of the free world asking us all to trust each other.